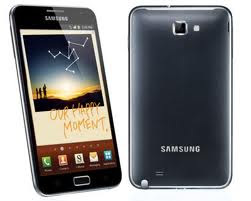 Samsung Galaxy Note Review - Samsung to launch Galaxy Note that is a mix between a smartphone and tablet. Samsung Galaxy is an Android based device that uses 2.3.4 Gingerbread 1.4GHz dual core processor with 1GB RAM and GPU Mali-400MP. Note Galaxy has a size of 5.3-inch Super AMOLED screen with a resolution of 1280 x 800 pixels and comes with a stylus, S Pen. Galaxy Note can be regarded as the incarnation of S II, of the wider screen. Galaxy Note has a size of 146.9 x 83 x 9.7 mm with a weight of 178 grams. Galaxy Note is equipped with 8 megapixel camera with 1080p HD video recording capabilities, a 2 megapixel front camera, 16/32GB internal memory options, and microSD slot. Galaxy Note entertainment facilities at no less exciting. capable of displaying a sharp image. Note that make the Galaxy is more fun and exciting is the record that could be made with photos or drawings. If you want to give an explanation on the photo, just take a photo of the gallery, and a stylus pen. With the main feature to note the passing hand scratches, Samsung Galaxy Note is right for your friend who often make little notes. Despite its size all-hearted, still comfortable to grip.